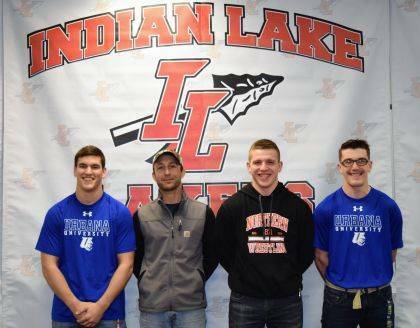 It was a historic day for Indian Lake High School Wrestling on April 17. Surrounded by family, friends and fans, three wrestlers signed their letters of intent to continue their athletics at the collegiate level. 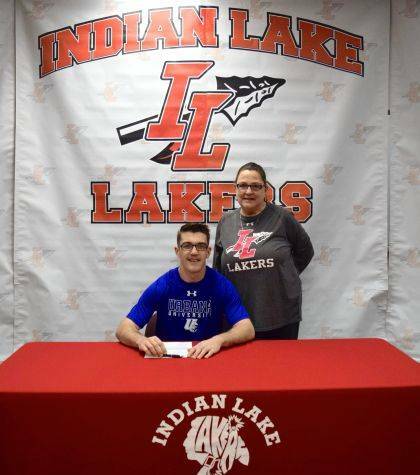 Connor Dixon signed his letter to wrestle at Urbana University under new Head Coach Brett Smith. With a career record of 147-46, Connor placed fifth in the state in the 182-pound weight class. 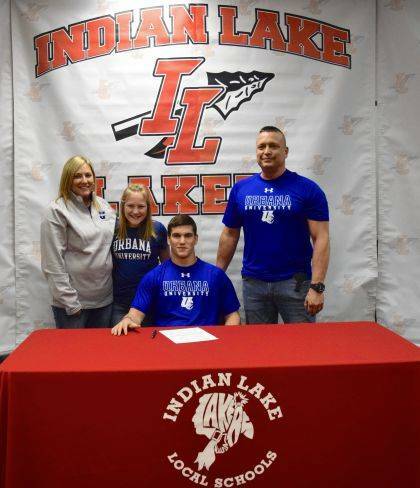 Dixon says the facilities and atmosphere at Urbana University feel similar to his wrestling home at Indian Lake. Dixon earned a partial athletic scholarship. He plans to study criminal justice. His teammate, Dylan Knotts, will be joining him as a Blue Knight. Knotts also signed his letter of intent. Knotts was district champion in the 160 lb. weight class and wrestled at the state meet. His career record is 109-42. Knotts is originally from Champaign County and is excited to return. Knotts also receives a partial athletic scholarship and he plans to study exercise science. 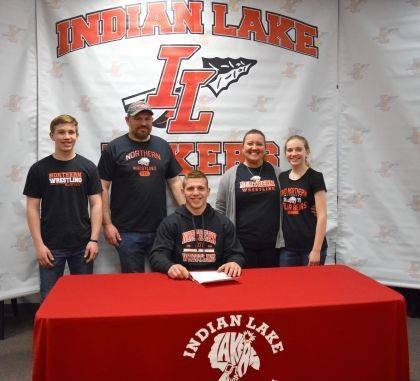 Finally, Cole Mefford signed his papers to wrestle for Ohio Northern University. Mefford placed 7th in the 220 lb. weight class at the state wrestling tournament this spring. Mefford will wrestle for Polar Bears Coach Ron Beaschler and has committed to the university’s ROTC program. Mefford’s overall career record was 103-42. He receives ROTC scholarships and other grants for academics.